It is finally that time of year… The snow is melting (at least for now) – we have had temperatures in the 40s the last few days, and today actually got up to 63 degrees! The nights are still cold (last night was around 30, so just below freezing). This is the time of year that the maple sap starts running. I have a few sugar maples in my yard. I have fond memories from when I was a kid – my dad would go out and drill holes into the trees, tap them, and we’d cook the sap down and make syrup. I have been wanting to make syrup again and show my son how fun it can be. Last year we moved here in January – I knew that somewhere my dad had tree taps from when I was younger. He hadn’t made syrup in years, but he never threw anything useful out, so I knew they were here somewhere. I could not find them anywhere. I looked at stores as well and could not find any that were carrying tree taps. The days got warmer last year and I heard people talking of tapping their trees, and I was very jealous. The end of March / early April when we were cleaning out the sauna building to make our chicken coop, I finally found an old coffee canned, filled with tree taps (they are really called Spiles). By that point the sap was almost done running. I brought my son Daniel outside and we tapped one of the trees. We did not get much sap – it was just too late in the year. This year I planned on tapping trees at the correct time. Last summer I had put the can of spiles somewhere I would be able to find it again. And then we did a bunch of renovations and rearranging of stuff (moving things from the workshop in the house to the garage). So this winter I went to find the can of spiles, and couldn’t find them anywhere. I finally found one spile in a junk drawer. That’s not really enough though, because you need a lot of sap to get a tiny bit of syrup. I started asking at stores early this year, and one place told me that although they didn’t carry them, they knew where I could find tree tapping supplies. They directed me to a store called Festival Foods in Houghton, Michigan. I found spiles there. I bought 2 spiles and a few sap collection bags. I opted for bags over buckets because buckets were way more expensive. This weekend it was pretty warm so my husband and I went out to one of the maples and tapped it. The tree is very large so we were able to put all three spiles into the tree in different spots. My noob-style tree sap collection setup. As you can see from the picture, the bags are not the easiest thing to work with. When I bought them, I saw there was a setup you could get to make it easier, some lid-like contraptions and some metal band things. Those were extremely expensive. The bags were 39 cents each, but the lids were like $12 per lid. I didn’t want to spend that much so I figured I’d wing it. I ended up using duct tape to tape the bags in place for now, because the wind was whipping them around a lot. I went inside to get tape and when I came out one of the bags was way into the woods – 40 feet or so. That does not seem far, but when you have knee deep (at least) snow, it gets a little tiresome to trudge through. I went in, grabbed that bag, and taped them all up. Next year I will use buckets. Since we don’t have lids on the bags, I’ll have to filter the sap (to make sure I don’t get bits of tree or stuff that has fallen in, into my syrup) and then cook it down. I don’t want to make a ton of syrup, so I may just fill these up once. The sap wasn’t running so much the last couple days, but today it is really flowing, so my bags are starting to fill. I’ll pull them tomorrow and start cooking it down – you don’t want to leave it in the bags too long, I have read, because it can go bad if it gets too warm. I’m excited for homemade maple syrup! Next Article Home grown edible mushrooms! We go to Houghton about every 2 weeks – it’s the closest place to get Chicken food 🙂 We’re only about an hour away, in L’Anse. 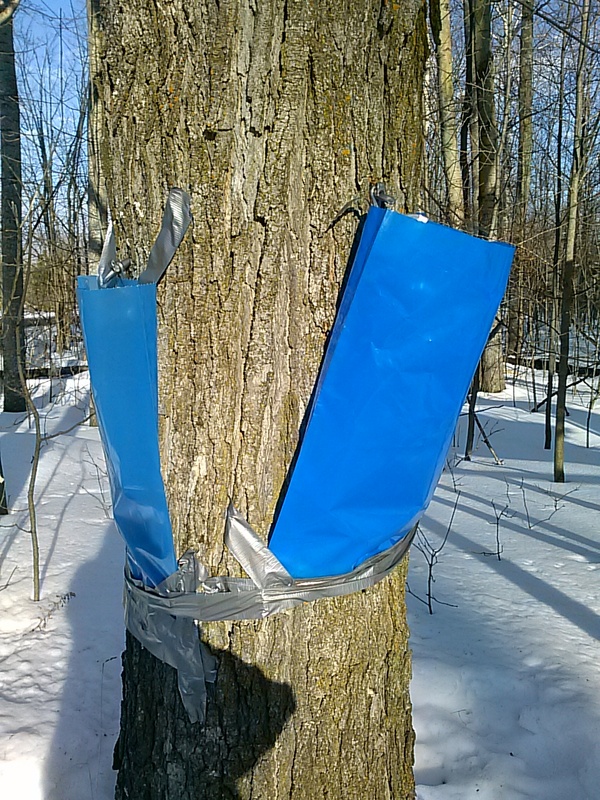 I guess any maple tree will produce sap, but sugar maples produce it faster (have a faster flow) – I’ve heard you can even tap birch trees and get a birch syrup. I can tell Maple trees when they have leaves, but I don’t know how to differentiate between kinds of maples. I just know a few certain ones in our yard are sugar maples because my dad told me. I need to get an identification book. It may be hard to figure it out at this time of year. I’ve heard you can tell by the way their branches are set up, though. I didn’t remember doing that! 🙂 I remember the big trash can, but not the clean milk jugs. We collected for a couple weeks, then got tired of cooking it down (and worried about using too much propane – next year I’ll have to figure out some kind of outside wood-fired cooking method). We have a nice small amount of syrup. I’ll post an update with a pic of how much we got tonight).